It looks very similar to the other two versions, but with the Spring touch, obviously. We still see beautiful Fuji covered in snow, with the setting sun, behind it. This well-known view can be observed from the shore of the Yamanaka lake, which is located to the East of the mountain. There are other places around the mountain, to make the perfect shot, which you gonna be proud of. The branch with the rose flowers and petals flying around, I assume is blooming sakura. These are very similar to the ones found on the regular edition mug. The yellow flowers are the new elements. These are “Field mustard” flowers, a.k.a “Nanohana”. Apart from being the symbols of the spring in Japan, it is also used as food. You can buy it in stores in early spring, just before it starts blooming. 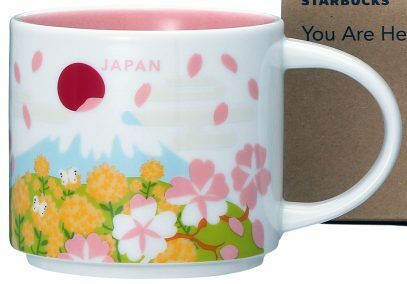 The back of the mug introduces Koinobori (“carp streamer”) which are carp-shaped wind socks traditionally flown in Japan to celebrate Tango no sekku. This is one of the five annual ceremonies that were traditionally held at the Japanese imperial court on the fifth day of the fifth moon in the lunar calendar. After Japan switched to the Gregorian calendar, the date was moved to May 5 and it now matches the Children’s Day. Many places in Japan are decorated with koinobori from April to early May, in honor of children for a good future and in the hope that they will grow up healthy and strong.